Table Runner uses our EZ Build 3 Inch Blocks as well as any other 3 Makes assembling and quilting blocks In The Hoop a snap! Our 3 Inch EZ Build blocks are used in this wonderful Table Runner or Wall Hanging. 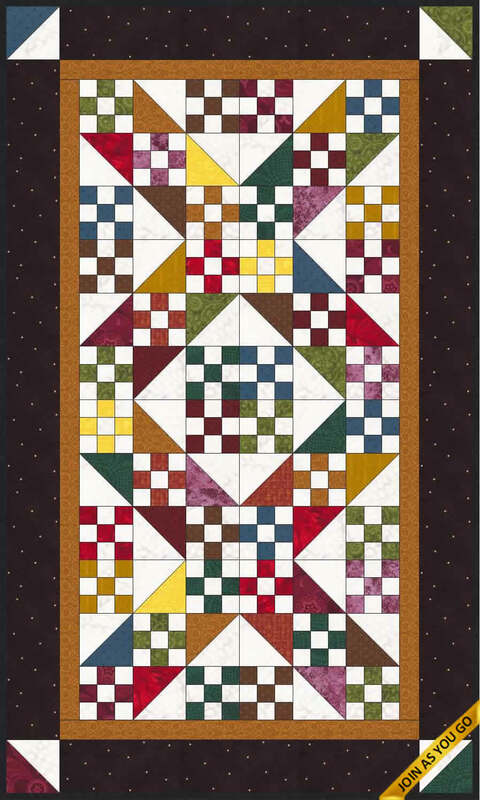 This version of the Table Runner includes 3 inch files for both EZ Nine Patch and EZ Half Square Triangles - If you already have our EZ Build blocks or want to use your own 3 inch blocks order Table Runner. Machine instructions for all 3 inch blocks that begin at 3 1/2 inches (seam allowance is included). The assembly block for this design allows ALL 3 INCH BLOCKS to be used regardless of how they were made. This means that if you have a collection of 3 inch blocks (should be 3 1/2 with seam allowances) you can use this file to assemble and quilt them in the hoop.